On Saturday, the European Society of Cardiology, ESC, together with the European Association for Cardiovascular Prevention and Rehabilitation and the European Heart Network, officially launched the “Environment & the Heart Campaign” to raise awareness about the need to create healthy environments for the protection of heart health and to encourage policymakers’ action. The campaign was launched at ESC Congress, the world’s largest and most influential cardiovascular event, gathering over 30,000 delegates for five days in London. Environment and the Heart is the spotlight theme of ESC Congress 2015, and new research will be presented on this increasingly important risk factor. Particulate matter and nitrogen dioxide pollution are associated with increased risk of severe heart attacks despite being within European recommended levels, according to research presented at the ESC Congress today by Dr. Jean-Francois Argacha, a cardiologist at University Hospital Brussels, in Belgium. Ambient air pollution is a mixture of particulate matter and gaseous pollutants such as sulfur dioxide (SO2), nitrogen dioxide (NO2) and ozone (O3). Fine particle pollution, also called PM2.5, has the ability to reach the lower respiratory tract and carry a large amount of toxic compound into the body. PM2.5 and NO2 originate from the combustion of fossil fuels such as emissions from industrial plants or vehicles. 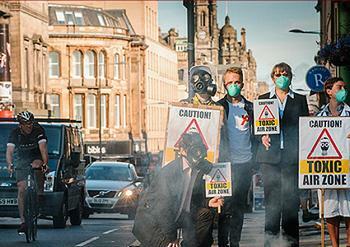 To combat this risk in the UK, the Supreme Court has ordered the government to submit air quality plans to the European Commission by the end of 2015. The UK Supreme Court ruling came after the government failed to comply with European limits on nitrogen dioxide set to protect health and outlined in the European Union Air Quality Directive. In June, the European Commission took Belgium and Bulgaria to court over poor air quality, and Sweden was given a final warning. The European Court of Justice in Luxembourg has the power to impose daily fines if EU member states are found to be in breach of EU law. Noise pollution also increases the risk of cardiovascular disease, including hypertension and heart disease. In Europe, it is estimated to contribute to at least 10,000 premature deaths due to heart disease and stroke each year. Public policies can do much to protect health and, ultimately, to reduce the burden of cardiovascular disease in Europe. Healthcare professionals, patient advocates, policymakers and the wider public are invited to join the campaign by signing the online petition on change.org/p/environment-and-the-heart. The outcome of the campaign together with the collected signatures will be presented to European Commissioners for Health, Environment, Climate Change and Transport in Brussels on World Heart Day, September 29, which this year is focused on creating heart healthy environments. The campaign comes at a crucial time as Paris prepares to host the UN Climate Change conference from November 30 to December 11. There, world leaders are expected to sign a new international agreement to keep global warming below 2°C relative to pre-industrial levels.